Properly caring for your wig is so important! You can enjoy your favorite wig so much longer if you maintain it correctly. Typically, you’ll want to wash any wig after 8 to 10 wears. Lifestyle can affect this, however. If you exercise in a wig and sweat, or if you are around heavy smoke, you’ll need to wash more often. After a wash, a blow out with a round brush will keep your wig looking it's best. Read for a step by step guide on how to use a round brush with your wig! Round brushes come in different sizes and styles. The diameter of the brush affects the styling. Smaller diameters are better for tighter curls and waves. Larger round brushes create looser curls and flips. You also probably want a larger brush for longer hair. Be absolutely sure to not go with a round brush with any epoxy-ball tips. These seemingly innocent beads can cause major damage to synthetic or human hair wigs. Now it’s time to begin styling! When working with your wig, always have it steady on some sort of wig stand. You don’t want to blow out the wig while wearing it, and the stand keeps it in the same general shape it would be on your head. Once you’ve washed your wig, it's time to add some blow dry balm! Try Jon Renau's Blown Away Blow Dry Balm for human hair wigs! It’s time to dry! If your wig is synthetic, never comb or brush it soaking wet, instead blow dry it to 80% dry before brushing out and beginning your blow out with the round brush. A human hair wig can be brushed while wet and can make it easier to style. The 80% dry rule still applies to the round brush styling with a human hair wig! Keep in mind the parting limitations of your wig. If you have a lace front wig or a monofilament wig, you have parting freedom. If not, keep the original part. You’ll want to section off your hair into manageable portions. We recommend going with 4 sections. First, part from ear to ear and down the center. From there, use a rat-tail comb to give you ½ inch pieces of the hair. Be careful not to puncture the wig cap! You’ll work on one ½ inch piece at a time. With a wig or even with real hair, it’s best to start from the bottom and work your way up. Remember your four sections from before? Take a ½ inch piece from one of the two bottom sections. Place your brush at the base of your first ½ inch strand. You will then slowly pull the brush through the strand towards the ends, following with the hair dryer. Once you reach the ends of the strand, circle your brush a few times to ensure you properly dry the ends. Still with the hair dryer following, roll the hair around the brush and back to the base. While the hair is wrapped around at the base, this would be a great time to use the Cool Shot feature of your hair dryer. If you’ve never really understood the function of the Cool Shot button, prepare to learn! This button will use a burst of cooler air to close the hair cuticle, set the style, and add shine. Once the strand is dry and set, slowly and ever so carefully untwist the brush to release the hair. You will now complete these steps on each strand on the bottom sections, before making your way to the top sections. Once you have completed all of this, you’ll have a beautiful blow out! Make the style last with a spritz of finishing spray. If you are styling a human hair wig, normal hair spray can work. Please though – never use human hairspray on a synthetic wig. Normal hair spray can destroy a synthetic hair wig. But don't worry, we've got some hairspray designed especially for synthetic fiber! 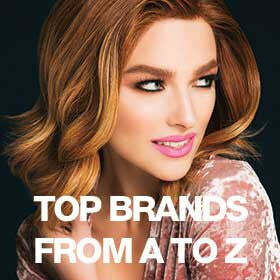 Only use styling products made for synthetic hair fibers. Have any additional tips for styling a wig with a round brush? Let us know in the comments! With both human hair and synthetic wigs, it’s best to wait until the hair is blown to 80% dry before begging to style with a round brush. With a synthetic wig, you will want to avoid brushing the wig while it is soaking wet. So, blow it to 80% dry and then comb it out. Then you are ready to section off and use your round brush! Human hair wigs are safe to comb or brush out while they are wet. If your not supposed to brush out a synthetic wig while it’s wet, how are you supposed to style the wig with the round brush? This is not clear for styling synthetic wigs. if you don’t comb while wet then what? you allow it to air dry and then take a round brush and a hairdryer to try and style it? Seems confusing?